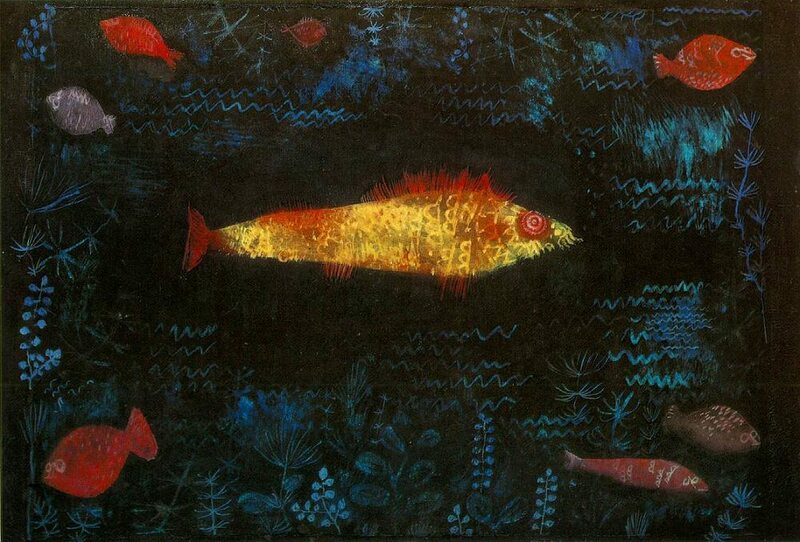 Paul Klee's attitude to animals was a matter of surprise to his contemporaries. From childhood on he kept a cat, and, as this was known, nobody was surprised at his man variations on this theme. This wondrous goldfish is in deep blue water, other little red and purple fishes rather keeping out of his majesty's way. There are tiny ripples in the water all around, and from the lower edge rise some light blue plants of simple form, such as are found in meadows and near ponds. the goldfish is giving off an inner light, and actually should light up the water, but the water remains dark. The goldfish glows alone with its improbable color. The cinnabar red fins and the red eye heighten the brilliance of the scales, which look as though embroidered upon the fish. Is it moving? Presumably it is, for the seven other fish seem to be running away from it. Calm as a god, it divides the blue element, which is deepest and darkest at the middle, where there is no trace of vegetation. Surely there is no reference here to stars or signs of the zodiac, or to other symbols - the goldfish is miraculous in itself, its size and its beauty. Everything is subordinate to it, everything else is present purely for its sake.